Thirty days has September, April, June, and November. That little rhyme is a common way to remember the length of each of the months; those four have 30 and the others have 31. The exception, of course, is February, which has 28, usually. Every four years — unless the year is divisible by 100 and not divisible by 400 — we add an extra day to the calendar. That day is February 29, and it bumps March 1 to the next day. But in no circumstance is there ever a February 30th. Unless you were in Sweden or Finland in 1712. In the late 1500s, Europe and Northern Africa used the Julian calendar, a 365.25 day calendar originally promulgated by Julius Caesar. The Julian calendar did not account for the fact that the Earth actually takes a bit less than 365.25 days to revolve around the Sun and, after a few dozen centuries, the Julian calendar no longer synced with the seasons. Of particular concern to Pope Gregory XIII was that Easter was supposed to loosely coincide with the spring equinox, but it no longer did. To fix this, in 1582, Gregory XIII promulgated the Gregorian calendar, which had fewer leap years than the Julian, and ordered it be enacted. Most Catholic nations did so by jumping from October 4, 1582 (on the Julian calendar) right to October 15, 1582 (on the Gregorian) the next day. This means that, in those nations, October 5-14, 1582, never existed. But not all countries followed suit so quickly. Of particular note was the Swedish Empire (which includes modern day Finland), which decided not to adopt it at first. But in the late 1600s, they thought better of it, and decided it was time to join the rest of the world. Yet even then, they were in no rush, and formulated a plan to ease into Gregorian adoption. Instead of dropping eleven days off their calendar all at once, they decided to simply ignore all the leap years from 1700 until 1740, thereby losing the eleven days over a four decade period. 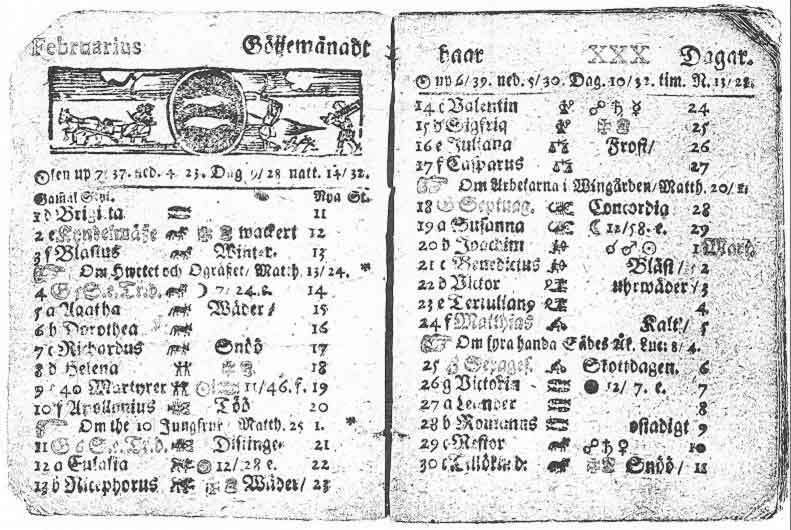 On March 1, 1740, the Swedes’ calendars would sync perfectly with those using the Gregorian calendar. Unfortunately, the plan went awry. For some reason, the Empire forgot to skip the leap years in both 1704 and 1708 — they had managed to drop only one day in eight years, and, even worse, were now no longer aligned with other holdouts still using the Julian calendar. So the King decided to fix the problem in 1712. Instead of simply dropping ten more days and joining the Gregorian nations, he instead rejoined the Julian ones. In 1712, the Empire had two leap days — one as usual, and one to make up for the lost day in 1700. That second leap day? As seen in an Swedish almanac from that year, reproduced above, it was February 30th. Bonus fact: May 35th also doesn’t exist — for most of us. In China, that date is used online to discuss the Tiananmen Square incident which occurred on June 4, 1989. As described by the New York Times, Chinese censors often filter out the date June 4th, so many use May 35th as a work-around — at least until the censors catch up. From the Archives: Year 100: North Korea doesn’t use the Gregorian calendar. Related: “Mapping Time: The Calendar and Its History” by E.G. Richards. 4 stars on 5 reviews.